Happy 4th of July! To celebrate today I’m back with a quick holiday themed Cavalcade Comics cover. If you remember, July 4th last year, I showed you Uncle Sam: The Ultimate Ninja. Well, I thought it was time to bring Uncle Sam back. But instead of my Ultimate Ninja version, I’m bringing you a more traditional version of the character. And he has a few words for Captain America. Yikes, Sam, that’s gonna leave a mark. I thought this idea was too perfect to pass up on this, the celebration of America’s Independence Day. And I thought labeling it Civil War II was appropriate since Marvel is actually doing Civil War II right now. So, where did I get the images? I found Uncle Sam from the cover of Freedom Fighters #8, June 1977. The cover was done by Rich Buckler. 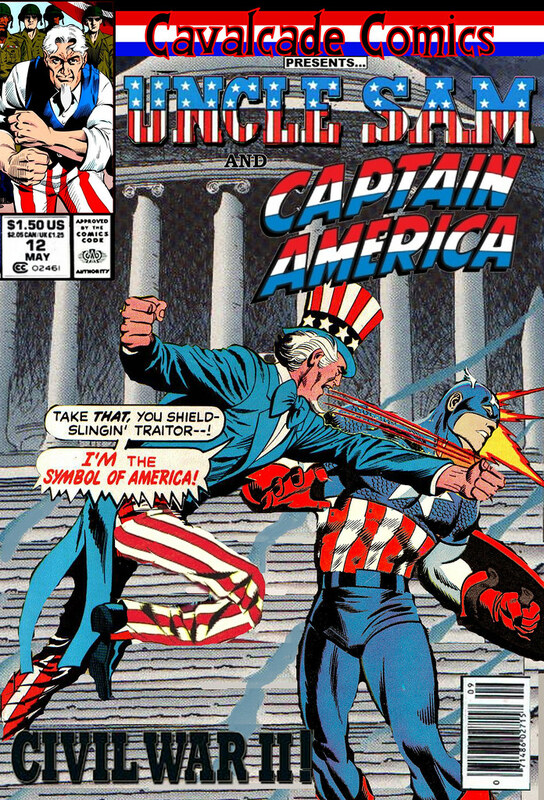 Captain America was taken from his own title, issue #124 from 1968. It was drawn by Marie Severin. I had to jockey around a few things but for the most part the images fit together nicely. Now, the background. I’ll admit, I had the HARDEST time finding a background that worked. I originally wanted the background from Freedom Fighters but it was a generic city street. I wanted something more “Washington DC”, like the White House or Capitol Building. 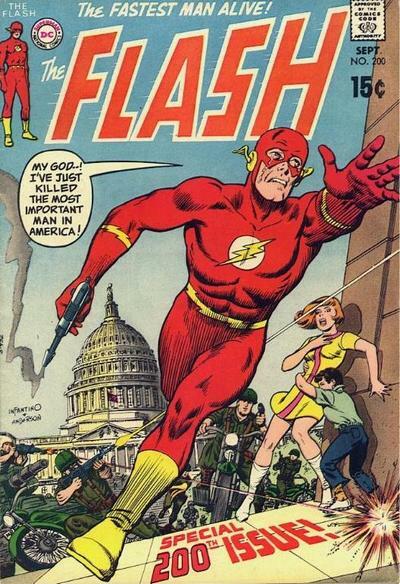 I was close to using The Flash #200 from 1970 as it had the dome in the background. But then I happened upon another Cap issue, #444 from 1995. And I decided to roll with that. As you can see, it’s got the nice government building in the background and I thought it would be great to have Cap and Sam slugging it out on the steps of that building. I had to change the perspective a little and use layers upon layers to hide Cap’s shield, but I think it turned out nicely.